C.A.T.C.H. (Community Action to Transform Cale Habitat) will be holding a jumble sale at The Balsam Centre on Saturday 8th February 2014 and are appealing for any items you may be able to donate. C.A.T.C.H. 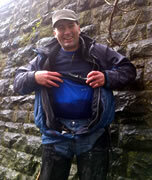 (Community Action to Transform the Cale Habitat) will be out again this Sunday to further nurture the River Cale. We invite any and all able-bodied individuals to come out, rain or shine, and support this worthy cause. 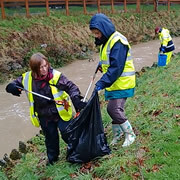 CATCH has scheduled a second river clean-up for this Saturday, 22nd June. We'll meet at the Recreation Ground car park, near the bridge, at 8am. All are welcome - join in if you care about our environment! The CATCH (Community Action to Transform the Cale Habitat) team has discovered, and now cleared a significant blockage in the River Cale. Check out the 'before' and 'after' shots. Here’s the long awaited video coverage of the recent in-depth (!) survey of the Cale undertaken by the Wild Trout Trust, provoked by two local dads on a continuing mission to improve the health of the river. Despite rain forcast for tomorrow, we don't want to delay initial action any further. We'll meet as planned and, at the very least, do a peripheral litter-pick of the river. 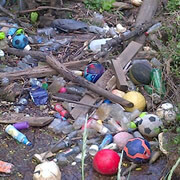 The River Cale has suffered from several pollution incidents including quite a lot of rubbish being thrown or blown into it. My friend and I have put a plan together to turn it around, but we need your help.